Occasionally I glance at some of the items on the FAOL bulletin board, and sporadically there are some questions about how to use a certain piece of angling equipment. Recently there was a question involving stream thermometers, and even a question about Mucilin, so let's look at some of the ancillary items that some of us carry around in our vests. One of the items that I have found most useful over the years is a small aquarium dip net. You can pick one up at a pet shop that sells tropical fish, and it is a great tool for picking emerging flies off the surface or for checking what is floating in the surface film. The net that I have in my vest is probably 30 years old. It has a green wire handle that I bent into a circle so that it would fit in my vest pocket, and a light green fine mesh bag. I keep it in one of the large zippered pockets on the front of my vest where it is easy to reach. Years ago I would have a small vial or two with alcohol to preserve the bugs that I would scoop up and a small notebook to record information about them, but I stopped doing that. The net will allow you to easily catch a floating mayfly, an emerging caddis, a terrestrial, or a mayfly spinner that is in the surface film. It will help you see the actual color of the bug and its size. This will make the selection of an appropriate artificial that much easier. (Remember to look at the underside of the insect for the color.) When you are done using the net simply shake the water off and put it back in your vest. The value of a stream thermometer is somewhat debatable, but I have used one for some time although I find in recent years I rarely use the one I carry in my vest. Back when JC and I were doing lots of stream research I kept rather detailed information on water temperature and correlated it to hatches and feeding activity. Overtime I became quite adept at telling water temperature by simply sticking my hand in the water, which was much simpler and quicker than using a thermometer. Today you can purchase a digital thermometer that will give you readings much quicker than the old standard thermometer, but the value of the stream thermometer to the angler is open to discussion. During periods of very warm weather a stream thermometer will allow the angler to find those areas where cooler water may be entering the stream from springs or other cool water seeps. Since cool water holds more oxygen than warm water trout may congregate near such places, and such knowledge might help you find some receptive fish during periods of high water temperatures. In the spring a thermometer may help you determine when your local stream is approaching optimum temperatures for the fish to become active. 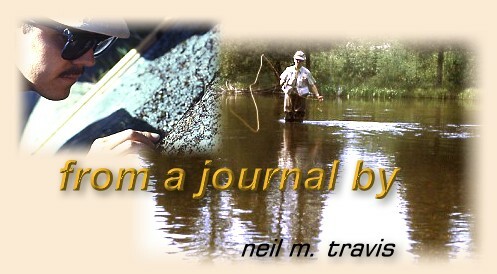 I found that I could simply drop my thermometer in the water along the bank while I was tinkering with my tackle before I started fishing, or let it hang from a short piece of old fly line attached to my wader belt. It is unnecessary to allow it to dangle in the water after you have taken the water temperature, and once you have the necessary information you can store it in a pocket in your vest. Hemostats are a valuable tool to have on your vest. I keep my hemostats on a zinger, but when I get ready to fish I take them off the zinger and simply clip them to a pocket flap on my vest. When I get a fish that is hooked inside the mouth where I don't want to stick my fingers (I fish barbless hooks so flies hooked in the outside of the mouth are normally easy to remove) they are readily available. After I have used them I clip them back on my vest, and when I am done fishing for the day I reattach them to the zinger. Clippers are an absolute essential, and it pays to have a good pair attached to a zinger. When I started fishing we simply went to the drug store and purchased a pair of fingernail clippers. That still works, but today there are clippers that are easier to use and remain sharp longer. There are a variety of other gadgets that one can purchase; however the only other item that I have found to be necessary for some of the types of fishing that I do is a light. Today there are a variety of fancy lights including some LED models, but the light that I have used for over 40 years is a goose-necked model that I purchased from Orvis®. It takes a couple double A batteries, has a clip to secure it in a vest pocket, and turns on by simply twisting the bulb assembly. After all these years it still functions just fine.